Sign language is used to communicate with people with hearing impairments, disabilities, and preverbal infants. Teaching children with disabilities how to use sign language is not as common a practice today as in previous years, possibly due to an increase in the use of computerized communication systems and facilitated communication. However, research suggests that teaching sign language via Total Communication (especially involving simultaneously produced signs and words) will likely accelerate a person's ability to speak. The idea of teaching sign language and speech simultaneously is sometimes referred to as Signed Speech. Sign language is useful for those individuals who have little or no verbal abilities or communication skills, including preverbal infants. Persons with a variety of functioning levels can be taught to use sign language. Many aberrant behaviors associated with autism and other disabilities, such as aggression, tantrums, self-injury, anxiety, and depression, are often attributed to an inability to communicate to others. Signed speech may, at the very least, allow the person to communicate using signs and may stimulate verbal language skills. A common characteristic of individuals with autism is their inability to attend to the nonverbal, social gestures of others. When teaching a person to use sign language, another possible benefit may be the facilitation of their attentiveness to social gestures of others as well as of themselves. There are several different forms of sign language. When implementing signed speech it is best to use the Signing Exact English or Signed English methods. This form of sign language uses the same syntax as spoken language and will help facilitate the use of syntactic rules of spoken language. Since the majority of people do not understand sign language, it may be ideal to use some form of picture system or computerized communication device in addition to signed speech to enable communication with those who do not understand signs. When beginning a sign language program, it is best to start with signs expressing needs, such as the need to eat, drink, and use the toilet. In this way, the person will be motivated to use the signs to communicate needs. It may take anywhere from a few minutes to a few months to teach the first sign, but as the person acquires more and more signs, it will be much easier and faster to learn new signs. Learning to speak is usually accelerated by teaching sign language and speech at the same time. One possible reason is that both forms of communication stimulate the same area of the brain. PET scans, which measure the amount of activity occurring in the brain at a given time, indicate that the same area of the brain is activated when a person talks or when a person uses signs. Thus, when utilizing the signed speech method, the area of the brain involved in speech production is receiving stimulation from two sources (signing and speaking) rather than stimulation from one source (signing or speaking). Also, if there are problems with auditory processing, this form of communication should be unaffected. American Sign Language (ASL) is a language that involves using your hands, body and face. ASL, just like all other languages, has levels of complexity. There are complicated grammar rules and sentence structures to remember. Not only do people who are deaf learn sign language, but some of them also learn how to lip-read and talk even though they can't hear! Most people learn ASL when they are very young. Sometimes, when they're only two or three years old. There are different ways for people with hearing disabilities to communicate. Some people with hearing disabilities only use sign language. Others may lip-read and speak as well as use sign language. Today, most children with hearing disabilities do not go to special schools. The teachers in these schools (containing children with and without hearing disabilities) stand before the class and talk and sign at the same time. This is called total speech. Not only do teachers do this but a lot of public speakers do too. Using sign language, you can take advantage of your baby's natural abilities to communicate sooner and reduce the stress for the whole family! The level of frustration that children feel diminishes significantly when a child can tell you what she wants. Tantrums are often caused by a toddler's inability to communicate needs or wants. Using sign language, you can communicate with your baby as early as 6 months and reduce the number of tantrums you encounter. And fewer tantrums mean a better relationship! Signing with your baby is easy and natural. Start between 6 and 9 months when your baby is starts interacting. If your baby is older, start now. It is never too early or too late to start. If you start earlier, you just might need to wait longer for results. If you start later, it helps with the frustration that occurs from 16-30 months due to inability to communicate. Even after babies can communicate, signing helps to bond the family. Signing builds on babies’ natural tendency to use gestures. Start with 3-5 signs for things you do freqently. The most common signs to start with are MILK, MORE, and EAT. If you know more signs, you can sign more. But, if you are learning along with your child, 3-5 signs is a manageable number to start with. Use the signs every time you are in the right situation. For example, when you nurse or give your baby a bottle, say "Do you want some milk?" and sign MILK. As your child learns the signs and begins to sign back, start adding other signs like APPLE and BANANA. Continue to use the signs you already use as you add new ones. Be patient. It takes babies time to learn to sign, but they can recognize the signs long before they can make them. For example, babies will often show their anticipation when you sign MILK by grunting or panting. Consider taking a class to learn the keys to successful signing and how to sign while reading and singing. Or check out a book or web site for more information. As our babies grow, they reach the "toddler" stage. They reach a certain point of self-awareness and independence! Suddenly, they begin to grasp the idea of communicating by words, they are imitating everything you do around the house, and they want to solve their own problems before they let you help. Signing doesn’t have to be phased out as your child begins to experiment with language, it can be a stepping stone instead. With infants, signing is usually their way of communicating basic needs. “Down” was the first sign my son mastered. “Drink,” “please,” “milk” – these are some of the signs they are most likely to use. As they grow, however, they like to state more complex preferences and even just make conversation about their observations. At this age, they are ever more likely to tell you how they want to play, as they try to control their surroundings. They might like to comment on what they see outside the car window. This is a great age to introduce signs for “dog,” “cat,” “hot,” “cold,” and other similar concepts. When my son was an infant, “down” was his way to request me to get him out of his highchair. He still uses it for that, as well as to get off the “big potty,” but now I use it as well to tell him I’m really serious about him getting “down” off the table, or to get “down” off the noisy toy while we’re having family devotions at Grandma and Grandpa’s. For me, the best difference between infant signing and toddler signing is a little different. When I was teaching signing at the infant stage, I kept wondering, “How do people do two-handed signs while they’re holding the baby?” Now that we’re at the toddler stage and he’s enthusiastic about gesticulating while he talks, I finally have both hands free! It’s inspiring me to expand my vocabulary, and maybe my son will master those two-handed signs and help me when it’s time to teach them to a little sibling. We all know each child is unique in their learning, understanding, and their capabilities, sign language is like any babyhood milestone and everyone approaches their first sign differently. The timeline of baby sign language depends on the factors of your particular signing situation. Infants have been known to sign back at their parents as early as two weeks to two months from the time you make your first sign, others aren’t as versed until six months or later, don’t give up! Other factors include how frequently you sign in your household, of course, the interest level and attention span in your baby or toddler, age, and when you first started signing (toddlers tend to pick up the signs faster.) After a pretty major brain “growth spurt” at approximately one year you can look forward to a larger memory bank of signs, and readiness for new ones. Every child learns differently, at different speeds, and has individual abilities, don’t be discouraged if you don’t see a response to signing right away, while some infants may pick up within two weeks some begin a little later and grasp the concept in a few months, each path is acceptable. When a parent connects with a child over the deep understanding sign can provide, the outcome is rewarding for the whole family. Not only is it a learning opportunity but it’s also an opportunity to bond and be together while acting silly, and laying the foundation for your communication relationship in the future. Teaching sign language to infants and toddlers is becoming more and more popular. What was once saved for the disabled is quickly turning into a second language for young children. There are many advantages for teaching your baby sign language; the most noticeable advantage is that the child will be able to communicate his needs with his caregivers. But, another advantage is that teaching your baby sign language can actually help them learn how to speak. When it comes to milestones of communication every parent is constantly looking for ways to help their babies along. Those first babbles, coupled with those moments of eye contact are irresistible and some of your baby’s first ways of connecting with you. Most moms and dads are well aware of the advantage that reading to your little can provide, but not everyone is so versed on benefits that come with sign language. Did you know babies who are taught to communicate their needs with signing, learn to speak naturally faster than their non-signing counterparts? All children learn very differently, but we can see that speech is normally closer to toddlerhood then it is to infancy. Lifting that head up, rolling, and crawling are expected long before you hear that heart melting mama and dada uttered from those pink little lips. When we introduce baby sign language and the words that go along with it, not only are we showing baby a physical way of communication but we are expanding their verbal memory well, allowing a much deeper and less frustrating understanding of words and their meanings. When talking about language we sometimes place a lot of importance on the words themselves and don’t always realize that body language is a huge part of getting your point across. Worried that signing might hinder language rather than develop it? Just as much as babes love the actions of signing, we can make the words just as fun to speak. Don’t forget to make baby sign language a fun and interactive process. For example, children develop an early curiosity for household pets so let’s embrace that with sign! It isn’t until approximately ten months of age you may start seeing your baby sign back at you and with a sign for every need you will definitely notice less fussiness when it comes to choosing meals, bedtimes, and everyday routines as your child will be able to tell you what they want in that moment and isn’t that every parents ultimate goal? With baby sign language you can promote independence, and a deeper understand of communication that will last them a lifetime. How does a parent learn sign language (so I can teach it to my baby)? So, you’ve been sifting through how-to books, and searching on the internet on baby sign language. As a parent you’re probably interested in the beneficial world of sign, but are questioning the decision because you don’t know it. The major benefit to sign language is how simple it is to pick up. Here are a few ways to ease your own learning so you can feel prepared to teach your baby. · Immerse yourself – While it’s not entirely necessary, you can look into your local community league or library. They sometimes hold free or low cost classes. If you’re looking to really learn the history, culture, and a deeper meaning behind sign with some one on one help this is great place to start. · Homework – The best way to learn anything that takes remembering is with practice and repetition that includes sign. You may need to practice on your own a few times without an audience to really nail the signs you want to teach. · Fun – Just like our kids it’s hard to learn something new when it’s dry and boring. Pick some of your words, or activities or even foods and start with those. Look in a mirror and sign to yourself or your partner, make your own flashcards, and feel free to teach your friends. · Go with the flow – You don’t need to have certain number amount of signs memorized before you start teaching it. The fun part if you don’t already know it is learning alongside your little. Choose to do one new sign a day or week, and don’t worry about perfecting it. If your toddler asks what the sign for something is and you don’t know it, try searching and learning it together, you’ll both have something to look forward too. One of the great things about sign language is its user friendly system. It’s easy to learn and it’s fun to teach. By really getting involved, looking online, practicing, we can have fun with our children and really relax about the fact that we are just as new to sign as they are. Take this opportunity to really be present and learn alongside your child. In conclusion, teaching sign language does not interfere with learning to talk and evidence indicates that teaching sign language along with speech actually accelerates verbal communication. Free ebook from the American Red Cross on the basics of signing. 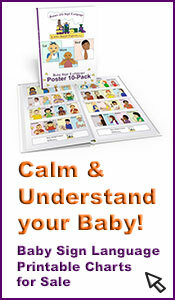 Sign With Your Baby (Book, Training Video & Quick Reference Guide) by Joseph Garcia. With a few of the simple signs in hand, little ones can actually help mom and dad figure out what they need. Parents looking for a new way to bond and communicate with their older infant and/or toddler now have one - this video, book and chart that teach elementary signing.